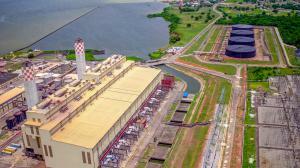 LAGOS, LAGOS, NIGERIA, November 7, 2018 /EINPresswire.com/ — Egbin Power Plc has signed a Side Letter to the 2011 Gas Sale and Aggregation Agreement (GSAA) with Chevron Nigeria Limited (CNL) and Gas Aggregation Company of Nigeria (GACN). The signing ceremony happened at the Transcorp Hilton Hotel in Abuja on Wednesday, October 31. Formalizing the agreement on behalf of the three companies were Dallas Peavey Jr., Sanjay Narasimhalu and Morgan Okwoche who are Managing Director of Egbin Plc., Director Downstream Gas of CNL and Managing Director of GACN respectively. The agreement has the distinction of being the first of its kind between a gas supplier and a power plant to occur in Nigeria. CNL is expected to supply 145MMBtu/d through the Nigerian Gas Company (NGC). The gas is then delivered by NGC to Egbin’s facility in Ikorodu. The significance of signing a Side Letter agreement is that unlike previous agreements and frameworks this will address temporary gaps in payment, transmission, and technical constraints. The agreement is designed to enable CNL and Egbin survive despite the current economic imbalance in the power value chain. This agreement has been described by stakeholders as another milestone in Sahara Power Group’s roadmap to become the most vertically integrated and recognized performance leader in Sub-Saharan Africa’s electricity utility industry.